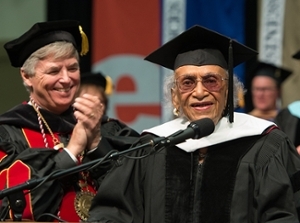 Civil Rights legend Frankie Muse Freeman, who received an Honorary Doctor of Humane Letters from SIUE during its May 2017 commencement exercise, passed away Friday, Jan. 12, in St. Louis. She was 101. Freeman spent her lengthy career advocating for civil rights issues that have had a lasting impact at the local, regional and national levels. Her body will lie in repose from 5-8 p.m. Friday, Jan. 19 in the Grand Hall of the Missouri History Museum. The public is invited to the viewing. Her funeral will be at 9:30 a.m. Saturday at Washington Tabernacle Missionary Baptist Church, 3200 Washington Ave. The service is open to the public. Visit stltoday.com for more information on Freeman’s influential journey.